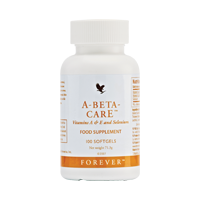 A-Beta-CarE contains vitamin A, which helps maintain normal skin and vision; selenium, which helps maintain the normal function of the immune system; and vitamin E, which contributes to the protection of cells from oxidative stress. N.B. Contains soy. Take 1 softgel twice daily. Refined soybean oil, capsule shell (gelatin, glycerol, water, carob extract (carob fruit extract, corn syrup, colour (caramel), D-alpha tocopherol, thickener (beeswax), beta-carotene, rosemary powder, carrot oil, emulsifier (soy lecithin), L-selenomethionine. Allergy advice: For allergens, see ingredients in bold. Do not use if seal under cap is broken or missing. Store tightly closed in a cool, dry place. Keep out of reach of young children. Food supplements should not be used as a substitute for a varied and balanced diet and a healthy lifestyle. Beta-carotene should not be taken by heavy smokers. If you are pregnant, breastfeeding, planning pregnancy, taking any medications or under medical supervision, please consult a doctor or healthcare professional before use.